In the UK, insects that sting include bees, wasps and hornets. When an insect bites, it releases saliva that can cause skin around the bite to become red, swollen and itchy. The venom from a sting often also causes a swollen, itchy, red mark (a weal) to form on the skin. This can be painful, but is harmless in most cases. The affected area will usually remain painful and itchy for a few days. 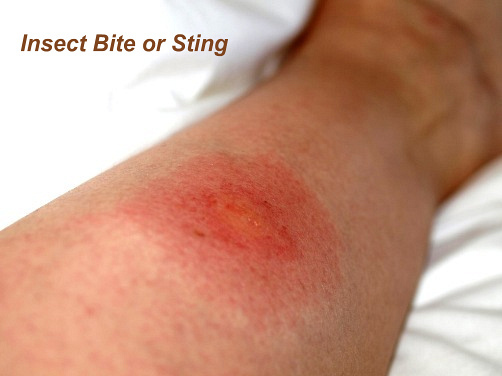 The severity of bites and stings varies depending on the type of insect and sensitivity of the person. See your doctor if you have a lot of swelling and blistering, or if there is pus, which indicates an infection. * Try not to scratch the affected area to avoid infection and if you are in pain or the area is swollen, take painkillers, such as paracetamol or ibuprofen. If you have a more serious reaction, your doctor may prescribe other medication or refer you to an allergy clinic for immunotherapy. You are more likely to be bitten or stung if you work outdoors or regularly take part in outdoor activities, such as camping or hiking. Wearing insect repellent and keeping your skin covered will help avoid a bite or a sting. Try not to panic if you encounter wasps, hornets or bees and back away slowly (do not wave your arms around or swat at them). It is important to be aware of any risks before travelling and get any necessary medication or vaccination.